In this blog, you will receive a comprehensive overview of our main innovation highlights for Sourcing & Procurement in our SAP S/4HANA Cloud 1711 release. With our 1711 release, we have again released many innovations to enable our customers to run their business operations intelligently. 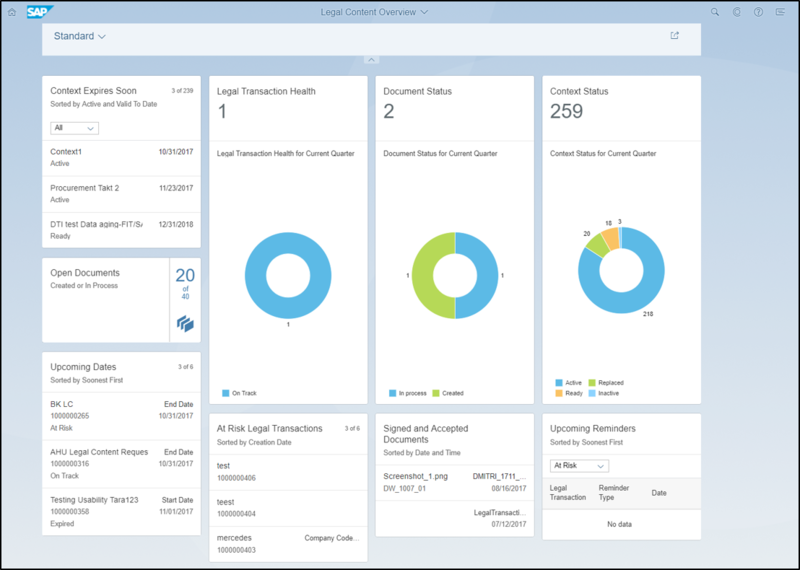 In case you have been following my blogs on Sourcing & Procurement in SAP S/4HANA Cloud, you already heard about the Legal Content Management functionality we introduced with the last release. If you want to revisit my last blog, you can find it here. With 1711, we extend the functionality with a new Overview Page for legal clerks and a new SAP Fiori app to manage legal documents. Using the Legal Content Overview Page, legal clerks have all information regarding to the legal operations of their company compiled in just one screen. Leveraging this OV page, legal clerks are immediately alerted when legal health of business transactions is at risk. Using the “At Risk Legal Transactions” card, legal clerks can drill down to each individual legal transaction which might be at risk for some reasons, e.g. the validity date is expiring soon, or there are still approvals missing. The “Upcoming Reminders” card, ensures that the user can always get a quick overview of most pressing reminders, so he or she can prioritize their work easily and effectively. To ease the work of legal clerks related to legal documentation, SAP developed the “Manage Legal Documents” app. The app offers search and filter capabilities, so that one can easily access needed documents. Hereby, users can also save their selection variants. Using the document list displayed in the app, legal clerks can download not only just one but also multiple documents. From the document list, users can then navigate to the document object page, where they can display, edit or delete the document object page. In addition, they can view the document history and track any changes to the document. Such tracking functionality is fundamental for legal departments. 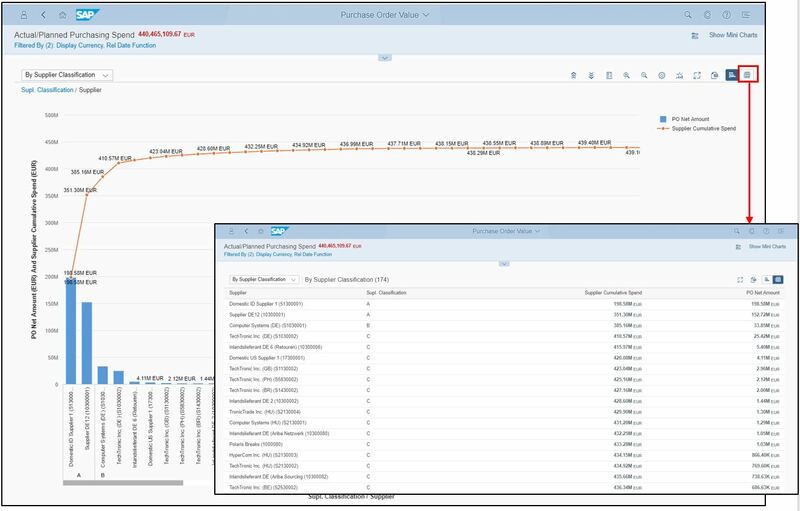 Since we are already talking about enhancements to functionality we shipped with the last release, I also want to provide you a very brief update on the SAP S/4HANA hub for central procurement. In addition to creating purchase requisitions, centralized confirmation and return delivery is now possible. In that manner, all employees that have access to the central SAP S/4HANA Cloud system can trigger the goods receipt or return delivery in this central hub without having to use their branch`s SAP ERP. 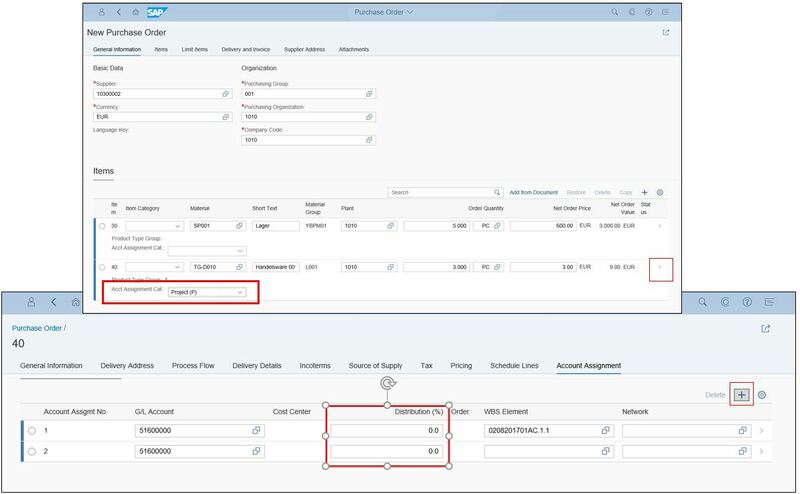 After a user has clicked “Confirm” or “Return” in the central S/4HANA system, the follow-up documents (goods receipt, return delivery) are automatically being created in the connected back-end SAP ERP systems. Correspondingly, users can enjoy the benefit of a streamlined SAP Fiori user experience. With the current release, we also enable Multi-accounting in purchasing documents for accurate cost accounting. Without Multi-accounting, purchasers can assign just one accounting category (e.g. cost center) to one item that shall be sourced. Enabled by the new Multi-accounting functionality, purchasers can now assign several accounting categories to such an item. The multiple account assignment options are available for Self-service requisition, purchase requisition, purchase order, contract, RFQ and supplier invoice (via WebGui). When creating a purchase order, users can specify the account assignment per purchase order item. Clicking on the “Plus” button, users can now define multiple accounts and the distribution of the costs of the purchase order item between those accounts. Surely, 1711 entails also innovations in the area of purchasing analytics. Here, I would like to emphasize three enhancements. To ease strategic procurement activities, we enable the classification of purchasing spend in A, B and C categories. As of now, we offer this segmentation for suppliers, material groups and purchasing groups. Based on this classification functionality, companies can segregate their purchasing spend, so that suppliers/material groups/purchasing groups in the A category constitute to up to 75% of overall spend, in the B category to 20% of overall spend, and in the C category to 5% of overall spend. Powered by this segmentation, strategic buyers can concentrate their efforts on those suppliers, materials or purchasing groups that have the biggest impact on their business and therefore can easily maximize their effectiveness. Moving on to the second analytics highlight, we enhanced the contract item object page with several new embedded analytics contents. As part of this enhanced information on the purchase contract item object page, you can review the release order history in terms of both the number and the value of releases per month (see bar chart below). In addition, purchasers can retrieve information on the contract consumption and contract leakage from a pie chart. From the object page, you can also get a list of alternative available sources of supply for this material. Using all this new embedded analytics content, purchasers can make better decisions on how to deal with a contract. Last but not least, purchasers can now check how material prices change over time. 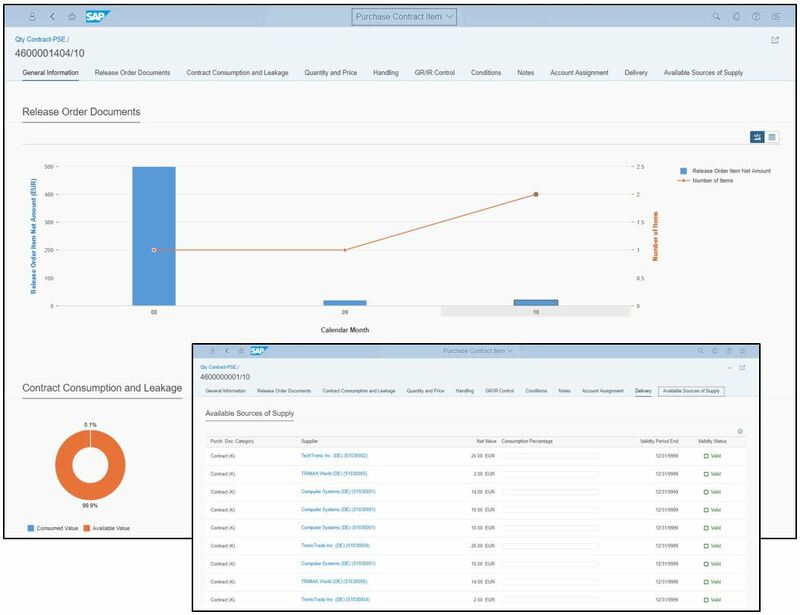 To do this, SAP released a new SAP Fiori app called “Monitor Purchasing Info Record Price History”. In the app, users can filter for those purchasing info records, they are interested in. Then, from the list view, they can click on “Price Analysis”. Subsequently, an embedded analytics chart will pop up which highlights how the price evolved over the last months. Leveraging the information of the embedded analytics chart, purchasers can monitor material price changes and analyze trends. Some materials are subject to huge fluctuations and seasonal trends. Equipped with this knowledge, purchasers can make strategically sound price decisions which depending on the volatility of the prices can have a big positive impact on costs for their organization. As you can see, another step forward in our instant insight to action journey.